Gaelic games plays a huge part in the annual sporting calendar in Howth Primary School. 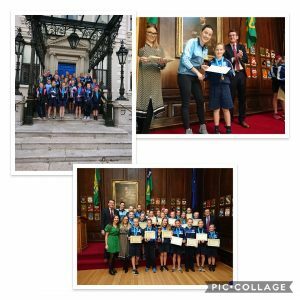 In the past 10 years the profile of GAA in the school has dramatically increased from 1 Seniors Boys Football team in the beginning to our current position of 6 GAA teams covering Hurling and football, competing at Junior Boys/Girls level (3rd-5th class) in both codes as well as Senior Boys/Girls in both codes. The school partakes in the Cumann na mBunscol competitions in both hurling and football and the Fingal Leagues which is a football only competition. 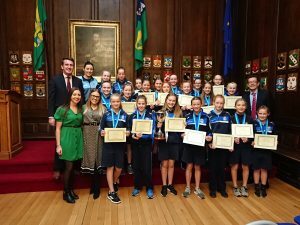 Our school teams have enjoyed a huge amount of success in recent years winning Junior Boys football titles in the Fingal League and our Senior Girls Football team are the current holders of the Cumann na mBunscol title. Great days out in Croke Park and Parnell Park have created many wonderful memories and hopefully there will be many more to come as GAA goes from strength to strength here in Howth Primary School. 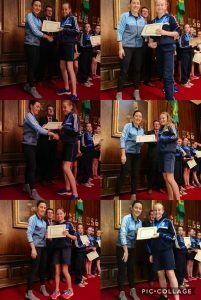 A day in The Mansion House for our senior girls’ team! 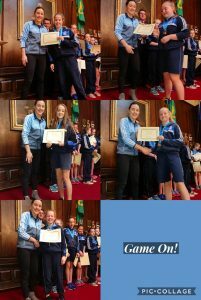 On Monday, 19th November, the players from the triumphant senior girls’ team were presented with certificates for their achievements. The prestigious event was hosted in The Mansion House. 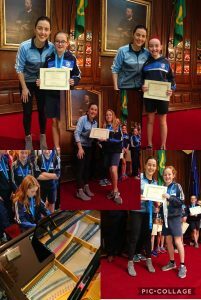 Senator Aodhán Ó Ríordáin and Dublin ladies star, Lyndsey Davey, were there to celebrate such a special day with the team.